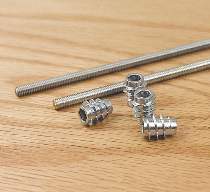 Threaded inserts are used for projects frequently assembled and disassembled. Install threaded inserts with an Allen wrench. Rods are 12" long.